Home / Articles / What Does A Hanged Man Mean In Tarot? What Does A Hanged Man Mean In Tarot? Does a Hanged Man gave you a bad or negative impression? Well, the Hanged Man features seemingly contradictory imagery. The central image on this card is of a man hanging upside down from a T-shaped tree in what would be a very uncomfortable pose. However, he looks relaxed with his precarious position. He is bound to the tree and suspended by one foot while the other foot is free and crossed casually. While one might expect his face to be worried or concerned, he is smiling and seems to be at ease with his situation. The Hanged Man features the number 12, which has its roots in fresh starts, logic and spirituality. The ruling planet of this card is Neptune, which is the planet of sacrifice and idealism. When you combine the imagery of the card with the importance of the numerical value and ruling planet, this card indicates sacrificing for the greater good and the need to submit your will to the mysteries of the Universe to prevail. In traditional Tarot decks, The Hanged Man is hanging upside down from a T-shaped tree featuring bright green leaves and new growth. The tree is a classic symbol that connects the heavens with the underworld and the leaves symbolize growth. Additionally, the colors of the card provide critical insights into the meaning of the card: the red tights represent the human condition and passion while the blue tunic represents wisdom and knowledge. The color yellow is found both on his shoes and in the halo around his head indicates elevated principles and spiritual realization. 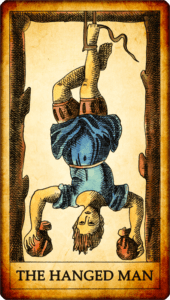 In general readings, The Hanged Man indicates a time of indecision, hesitation or even suspension and it is this period of waiting is vital and allows for something new to bubble to the surface. In a reading about love, it is a powerful indicator that you may have to give up something in the present to reap your rewards in the future, especially in regards to your relationships. Additionally, the appearance of this card should encourage you to examine your most intimate relationships and ask if you are sacrificing too much with too little in return. If this card appears in a tarot spread focused on your career, it is a sign that you may have to wait out unfavorable conditions or give up a tempting offer to meet your long-term goals. Focus on your ultimate goal and don’t let yourself get distracted by short-term gains. The Hanged Man in the reversed position takes much of the positive associations of sacrificing for the greater good and patience and turns it into martyrdom, inertia and loss of faith. It may also be a sign that you are acting selfishly and that you may need to reach out to others in your life.The Hanged Man is a card of intuition and spirituality. Its appearance in your reading is a powerful signal that you may attain your goals and make the world a better place. Next Is Temperance Card A Bad Sign? 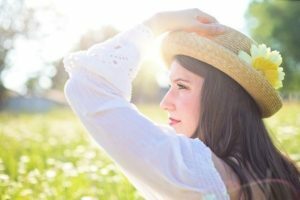 Looking for the Next Big Thing?